The world's finest pianos now grace the stage at Elder Hall, with the recent acquisition of two handcrafted Steinway Grand Pianos, collectively worth more than $500,000. Shipped from Hamburg, Germany - where the pianos were individually built - the Steinways represent the largest single acquisition by the Elder Conservatorium of Music in 20 years. 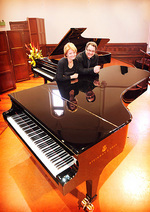 The Head of Keyboard at the University's Elder Conservatorium, Lucinda Collins, said the pianos were specifically selected to suit the size and acoustics of Elder Hall. "They are beautifully matched to allow for two-piano repertoire," Ms Collins said. The Steinways will replace two 19-year-old pianos - a Steinway and a Yamaha - that were purchased in the early 1990s. "The acquisition of the Steinways is significant for the Elder Conservatorium of Music, in particular Elder Hall, where audiences are accustomed to hearing high-quality performances of classical music," Ms Collins said. "They will give pleasure to so many people and have already generated a wonderful sense of excitement at the Conservatorium. Plans are already underway to celebrate their arrival with some special concerts in 2011." The Elder Conservatorium is highly regarded for the quality of its performance programs and music teaching, with the acquisition of the Steinways ensuring that piano students have access to the best instruments in the world. "The Steinway piano is recognised worldwide for the beauty of its touch, for its wonderful sound and for the range and beauty of its tonal colours," Ms Collins said. "As a pianist, they give limitless opportunities to explore sound and texture in music and provide a truly magical experience." The Director of the Elder Conservatorium of Music, Associate Professor Carl Crossin, said Elder Hall audiences would now be able to hear not only world-class piano performances, but also a world-class sound. "Whether it is for solo or two-piano recitals, concerto or chamber music performances, the beautiful tone quality of the Steinways will blend perfectly with the clear, warm, acoustics of Elder Hall," Associate Professor Crossin said. "We are already hearing piano music with fresh ears in Elder Hall and, when compared to our previous concert grands, we know that our audiences are in for a pianistic epiphany," he said. The new Steinway pianos will feature in the Elder Conservatorium's final public Masterclass for this year. See page 9 for details.